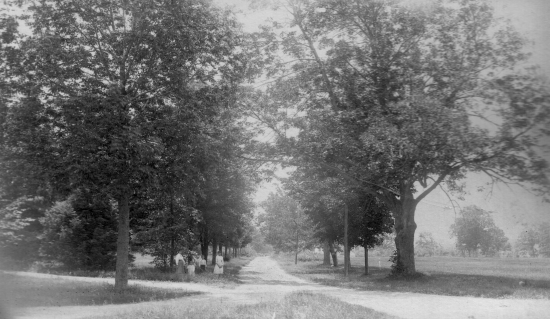 These pictures show scenes that were familiar around Needham in 1900. As quaint as they seem to us now, they represented the progress of their time. 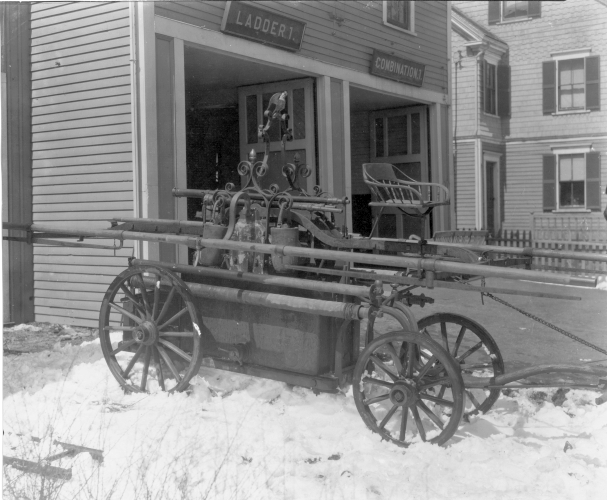 A pumper truck, even one that had to be pulled to fires by horse or by hand, was a great improvement over the bucket brigade. Trolley tracks ran down the main streets, making the trip to neighboring towns a convenience and not a burden. 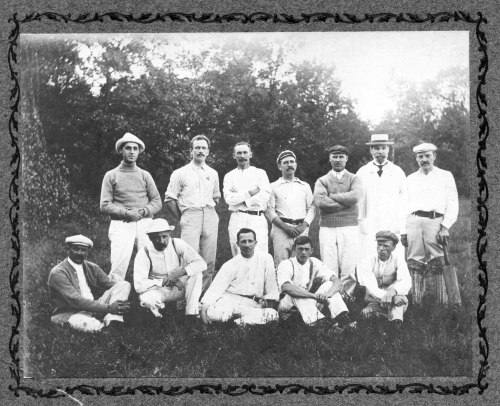 An influx of immigrants, first from the English Midlands, and then from Ireland, Italy and Poland brought new prosperity to Needham as the economic base shifted from farming to manufacturing. Nevertheless, Needham treasured its memories of an earlier time. 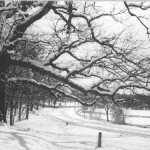 The Greenwood Oak stood as the last vestige of the old town center. A new monument in the cemetery commemorated a war that many could still remember living through. And the river, in its depths, preserved traces of a still earlier time, before Europeans had cleared and claimed the land for themselves. 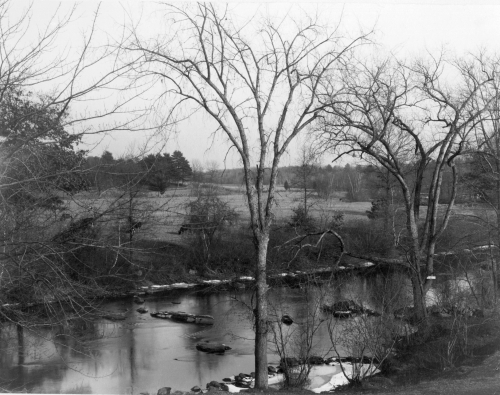 The Charles River near Dover, 1903. 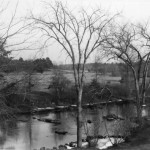 A significant drought in 1903 lowered the water level in the Charles River and revealed features long hidden from view. 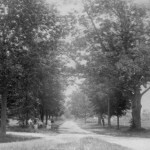 Great Plain Avenue at Webster Street, 1898. This corner is now the site of a familiar traffic light. The children, who look like they are waiting for the trolley, were placed in the picture to give it scale and a focal point. 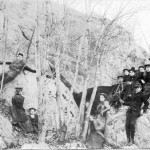 Devil's Den, c. 1900. 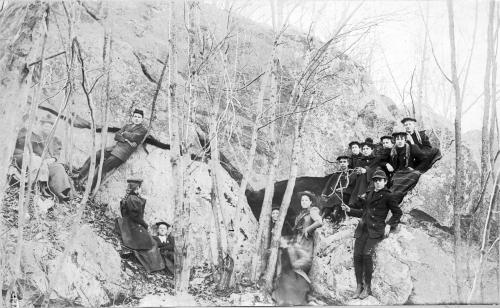 This small cave in the High Rock woods was a popular destination for hiking and picnics. 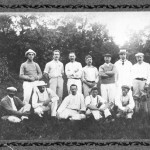 The Needham Cricket Club, 1904. 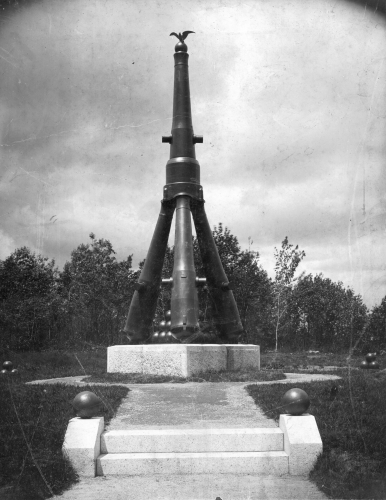 The Civil War Soldiers' Monument, 1902. 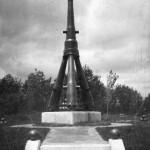 The Monument was erected on a lot purchased by the GAR Post 18. Over 400 from Needham served in the Civil War. 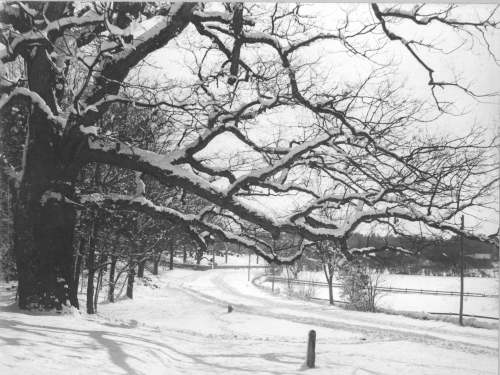 The Greenwood Oak, Nehoiden Street, c. 1900 This huge oak tree, estimated to be over 300 years old, once stood on the front lawn of the home C. C. Greenwood. 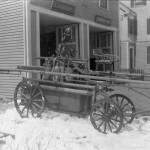 Needham Fire Company, Hose 1, 1898. 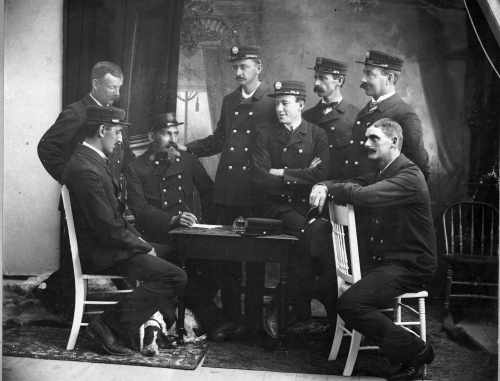 The members of Fire Company, Hose 1 sit for a portrait at the Abell Photo Studio. 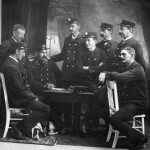 They are: G. Horace Pierce, Alger E. Eaton, Fred N. Mills, Edgar Pierce, Henry A. Kingsbury (Chief), Alston R. Bowers, Charles C. Barnes and H. Howard Upham.